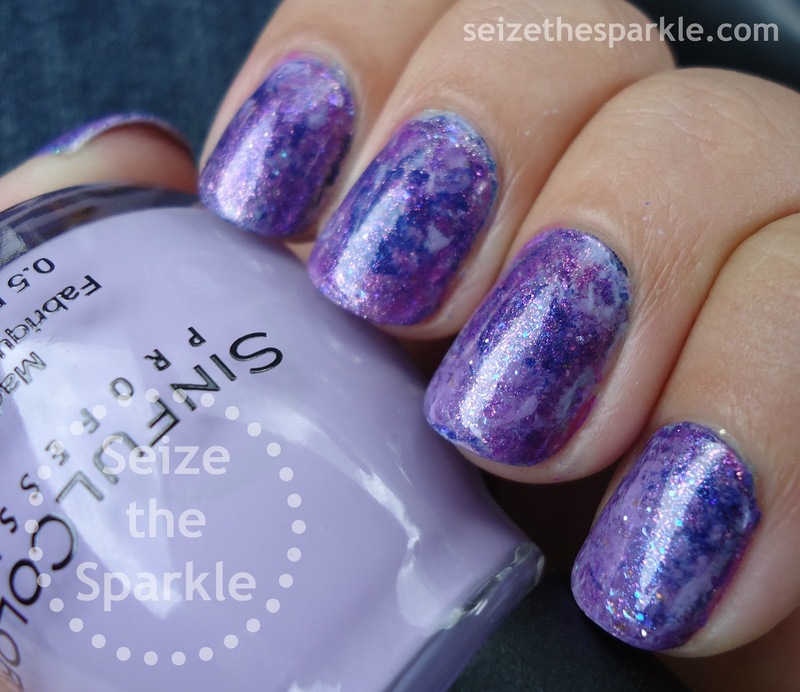 In December of last year, I mixed together a bunch of my flaky polishes to create Franken Flaky. I layered it over black back then, but I've gotta say, I like it over a deep purple much, much better! Not gonna lie, I was trying to emulate Unicorn Puke from Cult Nails by creating this. I'm not sure if giving this a little time to settle made everything mesh together a little better, but I feel like the flakes are better spread out here. I also used one less coat, so maybe that had something to do with it too. 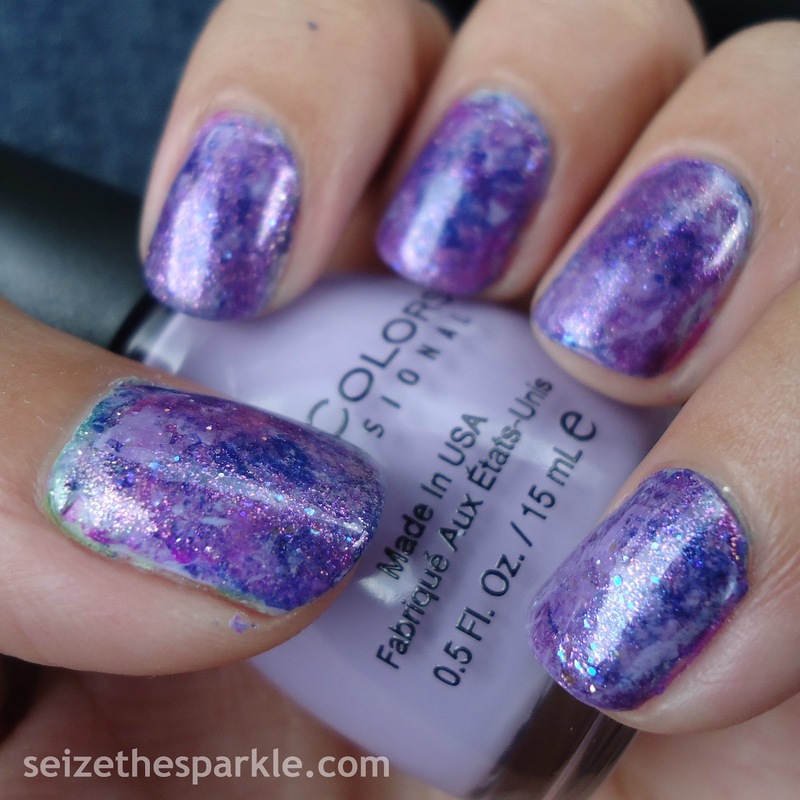 Either way, I seriously looooove this mix of glitter and flakies. I wouldn't be against making a larger bottle of it, either. There are days that I wish I would've bought backups for every polish in the Special Effects Collection from Fingerpaints. I definitely had the foresight to get a backup bottle of Twisted, but I guess I just didn't think I'd need/want the others? Note to Self, you will always, a-l-w-a-y-s need the others! call me Ridley! Can't say I'm really sure what's with all the vampy colors lately... something a little bit different, I suppose? Don't expect me to start waxing philisophically about sweaters and boots yet, though. Salted caramel coffee I can do, but I'm not ready for cold weather anytime soon! I don't remember where I first saw SinfulColors Fig... but the moment I saw it blogged, it was added to my wishlist. So, when PR contacted me about choosing shades from the new collection? I was thrilled to see that Fig was being brought back for the All Nighter Collection! Out of all the shades that I requested, Fig is by far the most Fall of the bunch. Not gonna lie, it was a little weird to paint such a deep, vampy shade on my nails when it's not even August! But the more I wear it, the more I don't really want to take it off. I'm by no means ready for cooler weather anytime soon. But Fall colors? I think I might be transitioning! So... why is Fig so special? It's a really warm and bright purple berry. 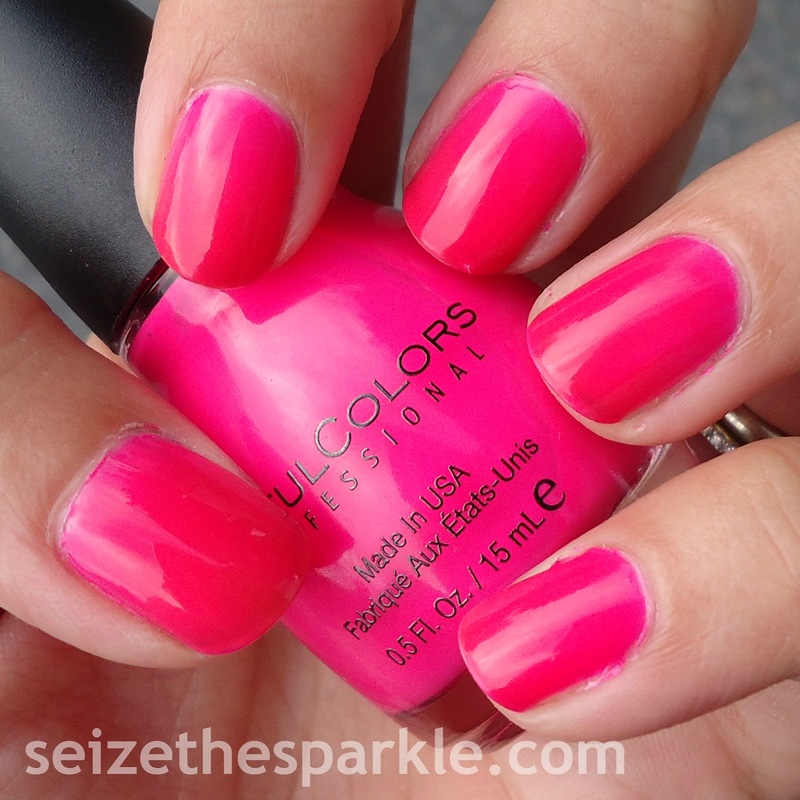 There's a super fine pink shimmer that runs through it that gives it a warm, shiny glow. Application was great, too. Three easy coats for me, but for some, I could see this being a two-coater! 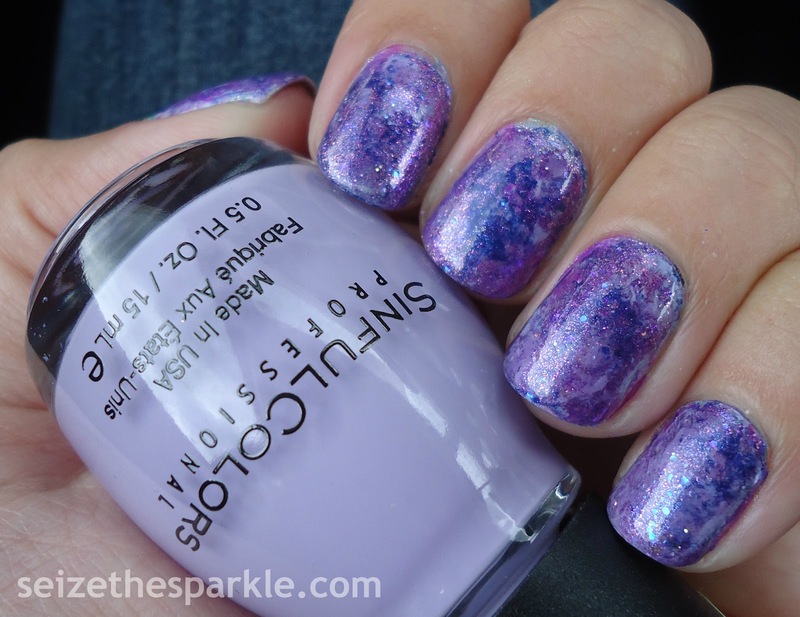 Fig is part of SinfulColors Class Act All Nighter Collection. You can find it on display at Walgreens and other mass retailers for $1.99 a bottle. The full All Nighter Collection also contains Blue Sensation, Casablanca, Daredevil, Glass Pink, Ice Dream, Late Night Haute, Night Owl, Purple Diamond, and Sinful Sunrise. Follow SinfulColors on Facebook, Instagram, and Twitter! After a very long time searching for the California Dreaming collection from Wet n Wild, I finally found this shade, Re: Incarnation, and Bee-U-tiful at Walgreens the other week. Sadly, there were no more bottles of Sun Settle Down or Green Tease. While I could probably live without Sun Settle Down, (it's orange) I am still looking for Green Tease. But I haven't seen this collection anywhere other than at Walgreens. Boo. Formula-wise, I've always like the mega-last line. This particular polish is a little thicker than the average. I'm not sure if that's because it's pastel? It self-leveled out well enough, but the problem wasn't streakiness. It was incredibly visible brush marks. As someone who paints right before bed, I often have to wait until morning to see if my polish leveled off. This seemed to meld a little bit when I added a coat of clear, so I crossed my fingers and went to bed. But I didn't realize that until this morning. Such is life. I really like the color of this polish, I just wish the formula were a little less thick. But if that's what it takes to avoid chalkiness and streaks, I'll manage. I haven't cracked open the other two yet, so I don't know if this is a thing with just Sky Me Mine, or if the entire collection has a thicker formula. Re: Incarnation is definitely calling my name, but before that? I feel like I need a little green. It's been a while since I wore green! Weekend-wise, it looks like it's going to be a decently relaxing one, and I really can't ever complain about that! Happy Friday to you... hope you have a nice, chill weekend too! Morgan Taylor Watch Your Step, Sister! Yep. Still loving it! I know I didn't get any of the negative white space in there, but I was going more to capture the collection of colors. And of course, I had to add some glitter! So far, I've talked about all but two of the polishes I used in this seriotype. 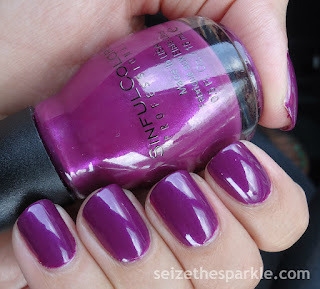 SinfulColors Jolt is a recent acquisition. It's a bright blue that's a shade or two less green than Savage. 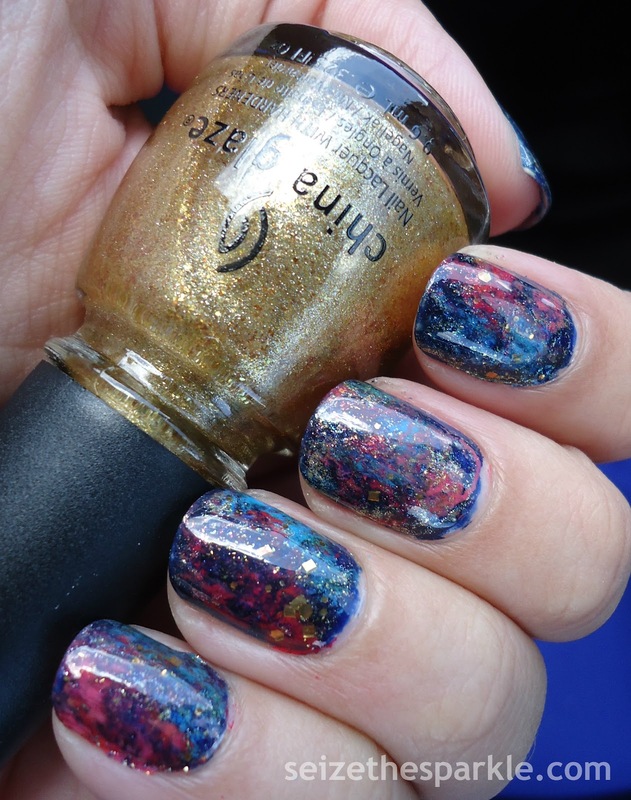 Costa Dorada is a gold glitter topper from my July Rainbow Honey Mystery Bag. Rather than hex glitter, it's got square glitter, but it does have a decent yellow tinge to the base. I had to go back over it with Indigo Motif to prevent the blue in the layering from turning green. So, I can't exactly say that this manicure turned out the same as it looked in my head. But that doesn't mean I don't like it. The look was inspired from a graphic at Church on Sunday. It was one of those moving on-screen graphics with a really pretty mix of glowing coral, pink, and aqua. I started out with Feel The Vibe as my base. Two easy coats and I was ready for random smatterings followed by saran wrap. Am i addicted to this type of manicure? Yes. I feel like it's safe to admit that here. I really can't get enough of how the colors mesh and meld together. While I do in general like how this manicure turned out, I'm not completely loving it. I think Feel The Vibe was a little too orange. I originally wanted to go with a coral and then started feeling adventurous. Treble Maker falls in the same category. A little too green of a green. Thankfully, it's #PLLDay today, so that means I'll get a decent amount of time to do my nails this evening. Especially if I can't make it out of Peanut's room in time for the 8PM airing. That's definitely been a problem lately! So, in addition to more clues about the identity of A/Charles/Black Widow/Red Coat... stay tuned for another mani tomorrow! Say hello to my newest favorite neon pink... Pink Happy Thoughts! I recently picked this up, 98% sure that it was from Big Lots, but there's a 2% chance it might have been from KMart. I'm thinking it's probably Big Lots, given that I haven't bought much polish elsewhere since we've been in the new house. While we're on the subject of the new house, the nail studio is definitely coming around. Just put away my pinks and reds last night. I shouldn't have been so surprised by the fact that my pink polishes no longer fit in one Helmer drawer... but I was! I'm going to have to go back and split them up, probably pales/nudes in one, brights/neons in the other. But back to Pink Happy Thoughts... it's my new favorite neon pink. I've actually worn it twice in the past week! 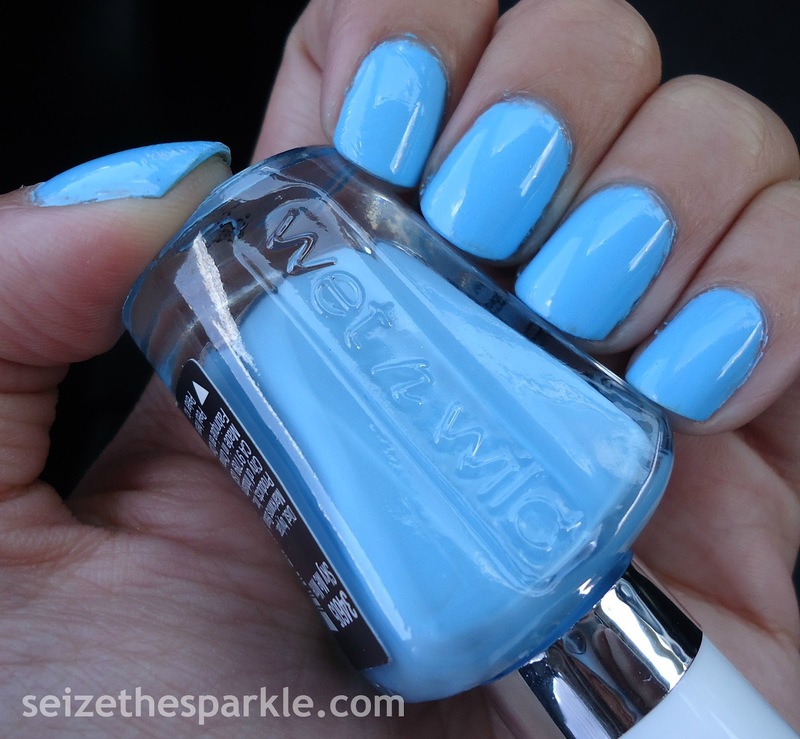 Like most neon polishes, the formula is sheer, but builds to what you see in the photos. Even at that point, there's still a little bit of VNL. The finish dries matte, but I shined it up with a coat of clear, followed by a coat of Seche Vite. Did I mention the fact that the prompts for Fishbowl Friday are totally subjective and open to interpretation? The prompt may have read 6 COLORS, but that really meant 11 polishes for a lovely seriotype with green, light blue, neon purple, navy blue, pink, lavender, gold, and glitter in at least 4 colors, right? I thought so too! 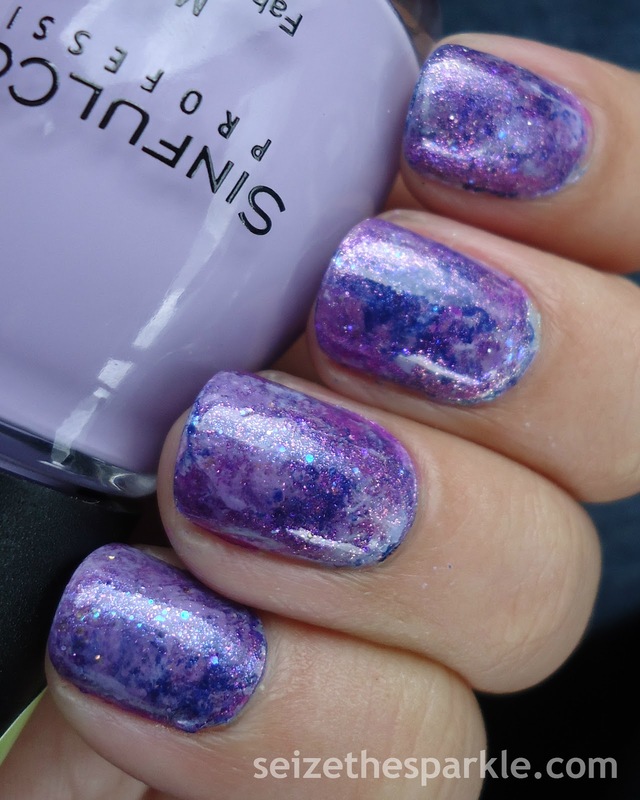 I started out this layering with a base of SinfulColors Truth or Lavendare and everything just snowballed from there. A little bit of this, dab with saran wrap. Some of that, another dab of saran wrap. I wasn't really sure that I would use all of polishes I originally picked out, but I think there were only 2 that didn't make the cut. I definitely made an effort to use as many of my Pure Ice shimmers as possible. I've been waiting soooooo patiently to play with them! All in all, I really love the way this turned out. It's a ah-mazingly gorgeous purple seriotype. It's like a galaxy of grapey goodness. I can't say that I was planning on it turning out with quite so much purple. That sort of happened by accident. A very gorgeous, glittery, happy kind of accident! Coming up, it's going to be a busy, busy weekend! We're going out to celebrate Mr. Sparkle's birthday with his parents tonight, so, I don't see any nail-painting time in the forecast for this evening. But I'm okay with that! I'm loving this seriotype so much right now that it needs to stay for at least another day. Speaking of tomorrow, that's another busy day, too. My sister and her husband are coming up for the weekend, so that means more fun family festivities tomorrow! Say it with me now... Happy, Happy Week-END! Happy, Happy Week-END! At first, I figured it was just a collection of re-promotions. Shades from this collection or that collection for back-to-school shoppers. But then I noticed all those little stickers on the lids, usually reserved for Limited Editions. I looked up the collection name and some polish names, but I didn't come up with anything while in the store. Once I got home, I did see that G from Nouveau Cheap had posted about a few new SinfulColors collections. 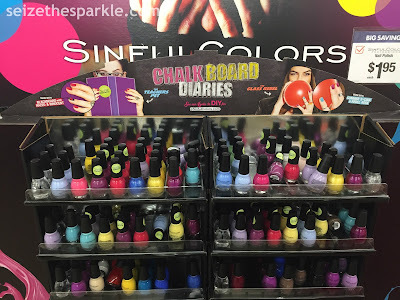 Turns out, in addition to holding the polishes from the Chalk Board Diaries collection, this display also had shades from the Play It Cool Collection. I didn't see any polishes from the All Nighter Collection in this display, though. When I removed my polish last night, I wanted to keep the glitter accent nails, because... glitter! At first, I thought about just painting the rest of my nails one color. Pretty quickly, I decided that would look a little weird, and I needed another accent nail. Summer S-Cool was sitting nearby and looked like it would work well with A-Crush. In reality, the two are more complimentary to each other than matching, but I like how they turned out. Something different, and I tend to like different! The formula on A-Crush was really nice. With a pastel collection, I kind of understand going with a demi-matte finish. Creme pastels can end up really chalky and streaky, and I think the matte formula on A-Crush kept that from happening. It was a little streaky at one coat with almost full coverage at two coats. I painted on a third coat just to make sure everything evened out nicely. Because Queen of Beauty and Summer S-Cool were both super shiny, I thought that A-Crush would look a little weird in its original demi-matte state. So, I added clear coat for a shiny finish to match my other nails. If Summer S-Cool had been the demi-matte, I probably would've kept that matte. I think just the one matte nail would've worked. All about the balance! I know I keep saying that I really need to get better about posting my hauls, and it's true. I really need to. I'll try and take a few snaps of my recent hauls tonight while I'm prepping for Fishbowl Friday. In all honesty, I need to put a good 2-3 hours of organization time into my new nail room, but that just hasn't happened lately. 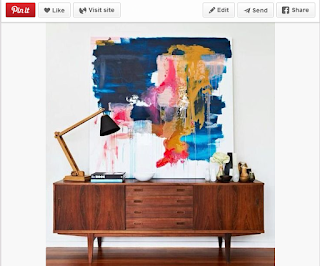 It's amazing how much time it takes to put things away and get organized when you move into a new space! 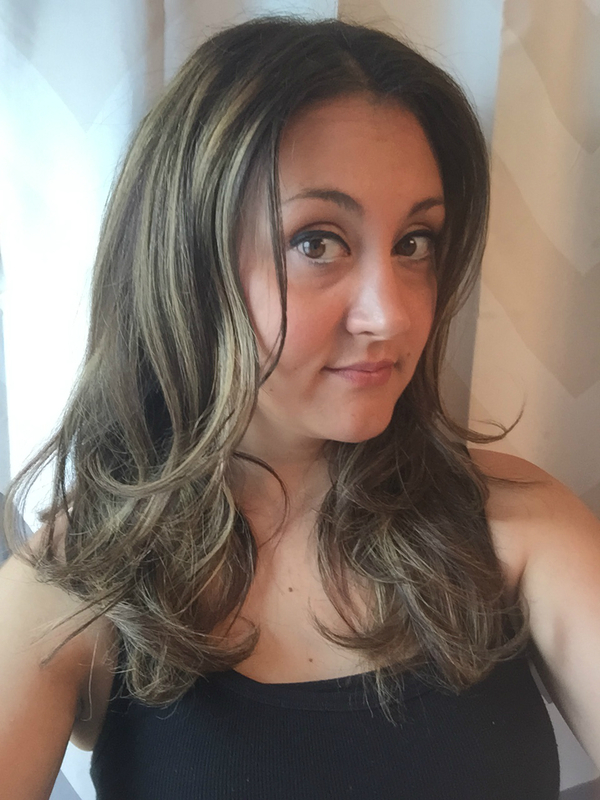 We're just about smack dab in the middle of the Summer Holiday... and that means it's time to talk about mid-summer hair. If you've been swimming a lot, (chlorine or saltwater) sunning it up, or you've got extra-thirsty bleached hair... you know what I mean. Summer takes a big toll on the health of your hair, and that's where Terax Hair Care comes in! I didn't intend to get quite the drastic highlighted look that I've currently got, but I do like it. Most days. I'm definitely planning on toning it down come Fall. 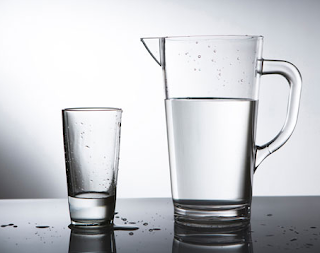 But let's get back to the point, shall we? My hair is naturally super dark, so for me, highlights require lots of bleaching. Bleach, as we all know, totally dries out hair. 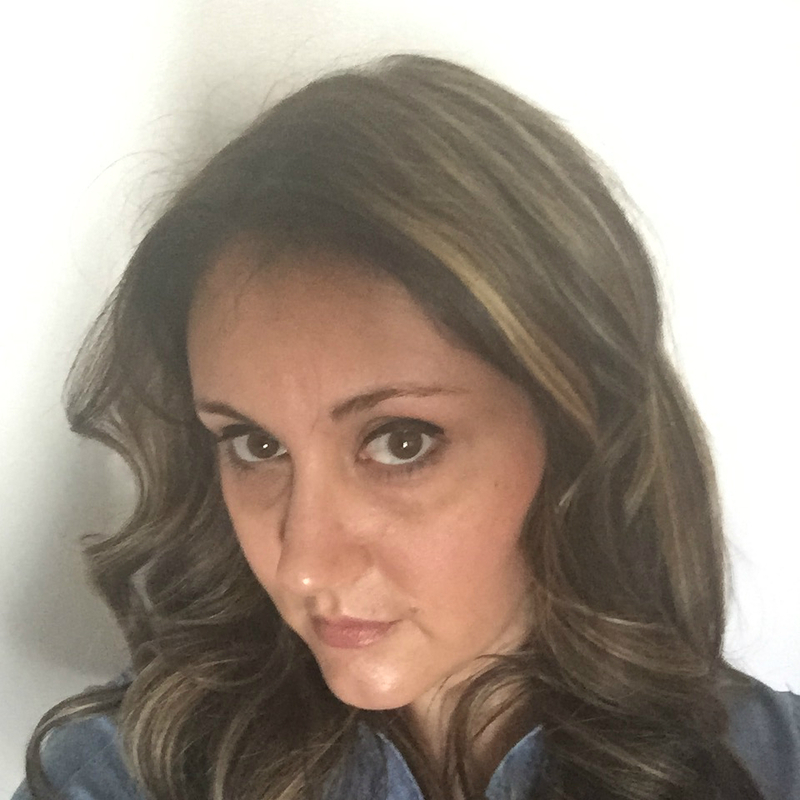 I've never used a conditioner like Terax Original Crema before. Rather than deposit moisturizers on top of the hair follicle like regular conditioner products, this conditioner actually opens them up and deposits all the nutrients your hair needs to feel super soft and moisturized. 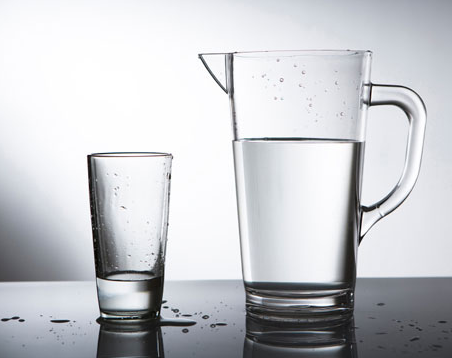 After rinsing, you use a regular conditioner to seal the hair follicles back up tight! According to PR, Terax Crema Original Moisturizing Daily Conditioner features "a unique blend of ingredients that revitalizes all hair types by reducing frizziness, improving elasticity and detangling hair, eliminating split ends while rejuvenating chemically and environmentally damaged hair." After using Terax Crema Original for more than a few times, (I'm about 2/3 of the way through the bottle) I can say that it definitely does make my hair feel softer and more moisturized. My hair just feels healthier when I use it as opposed to the days I go without. As far as frizziness goes, Terax Crema Original has definitely helped smooth my locks a little bit. Summer humidity is never kind to my hair, and it's been giving me quite the headache lately! In all fairness though, my hair isn't just frizzy, it's also fuzzy. Lots of flyaways. So, it's helped tame those a little bit, just not to the point of going without any of my other frizz fighting products. But like I said, I do have thick, frizzy, fuzzy hair, and it's the middle of Summer. Kind of an uphill battle. Scent-wise... well, I wouldn't really say that this has a scent. And that's definitely not a bad thing in my book. (I can be scent-sitive.) Because of the fact that it's meant to be used in addition to other hair cleansing products, I'm thinking that's why. Better to not have any scent at all than a scent that doesn't mesh well with other shampoos and conditioners, right? Wondering what this conditioner does if you've got curls? Peanut was more than happy to give it a try. Her hair is just as thick, frizzy, and fuzzy as mine, but she's got ringlet curls. While her hair isn't really damaged, it is usually quite tangled by the end of the day. 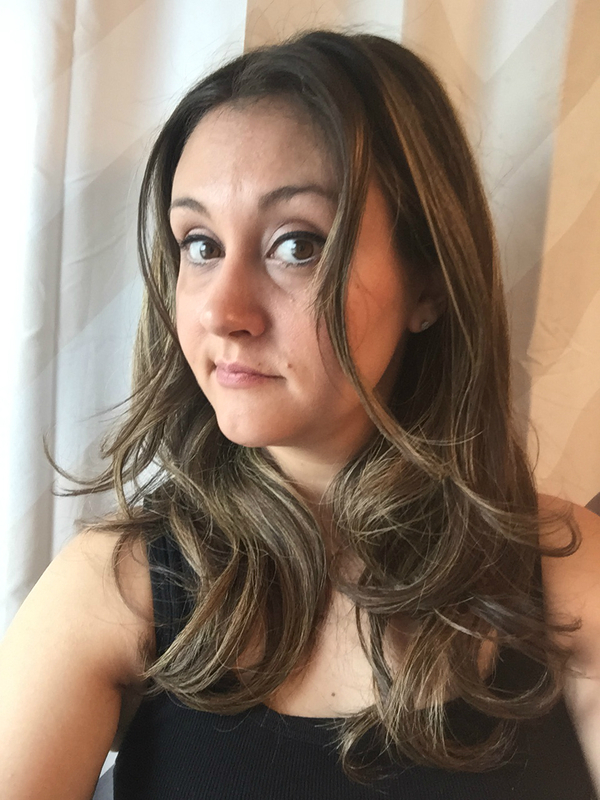 This conditioner made her ringlets curl up a little more tightly than normal and definitely smoothed out the frizzies and fuzzies. All in all, I would definitely buy this product again, because my hair is going to need constant moisture until the highlights alllll grow out. Before that happens though, I'll probably get toner and some lowlights thrown on, so... constant moisture will definitely be required at Chez Sparkle! Terax Hair Care is luxury beauty care, handcrafted by a family owned company for over 40 years. All of their beauty products are researched, formulated, and manufactured in their state of the art facility. As a micro-manufacturer, small batch production allows Terax Hair Care to offer the freshest possibly beauty products without sulfates, parabens, or artificial colors. Follow Terax Hair Care on Facebook, Instagram, and Twitter to find out more about Terax Original Crema and other Terax products. *Terax Crema Original Moisturizing Daily Conditioner was sent by PR for review. All thoughts, views, and opinions are my own. When I buy polish, I focus mainly on shade, finish, and formula. I don't really worry about dry time thanks to Seche Vite, and I rarely wear a manicure for more than a day or two. But not all polish enthusiasts are created equal. Some want a manicure that will last a really long time. So, gel polishes and the 14 day manicure are essentials for this type of lacquer lover. 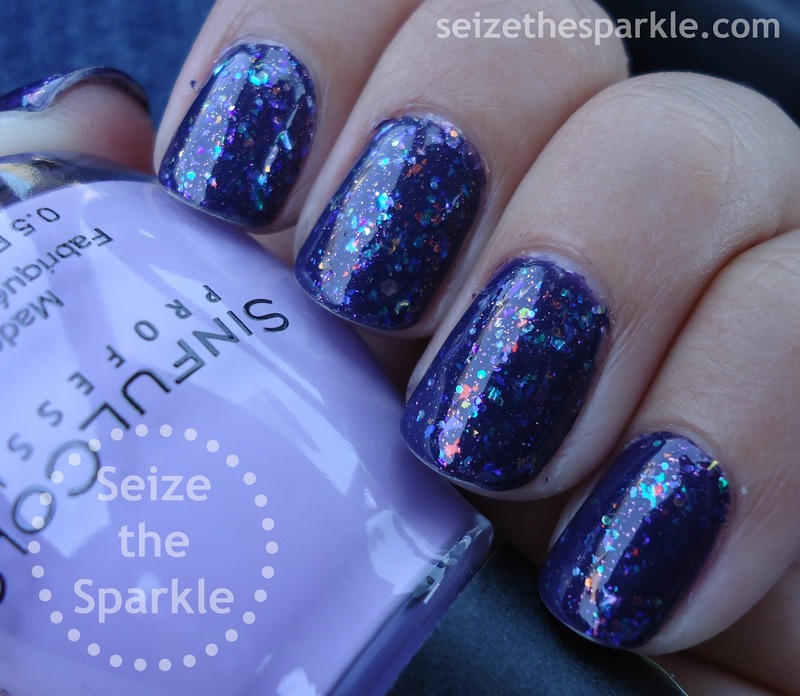 Joining the ranks of other nail wraps and appliques, SinfulColors recently introduced their own line of Nail Appliques with the launch of their summer Street Fusion Collection. Neon Splat is one of 5 Nail Appliques currently available. 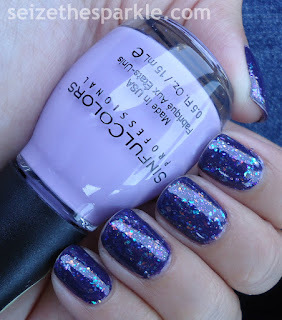 SinfulColors Nail Appliques are made from actual polish, so they're easy enough to work with. The best way I can describe them is a thin coat of already dry polish that you apply directly to your nails like a sticker. The appliques are tacky, and stick to the nail with just a little bit of pressure. If you've ever used appliques or wraps before, you know there's a zillion tricks to getting them to work exactly the way you want them to. Some bloggers recommend heating them up with a hair dryer to make the applique more pliable. Others show how you can cut them in half and get the most out of your appliques. Definitely some good tips that I might try next time. However, I was polishing late last night after Pretty Little Liars. My hair dryer was nawt close and I just needed 2 appliques for accent nails. First, figuring out which applique fit each ring finger best. For me, it was number 6 of the 8 appliques on the sheet. The 7th applique was actually too large for my ring finger, and #6 was a little small, but I got around that by painting a coat of Black on Black on my ring finger before putting on the Neon Splat applique. That way, any visible excess would appear to be black, just like in the design! If you do the same, make sure you allow time for that coat of polish to dry! Next, I centered the curved edge at my cuticle as best as I could and trimmed off the excess at the top. I firmly pushed the applique onto the tip of my nail and filed carefully with a fine grit nail file. After that, I topped the applique with a coat of SinfulColors clear coat, taking time to wrap my tips. That was followed with a quick coat of Seche Vite to keep everything together. I'm not sure if it's just the curve of my nails, but both of my appliques bubbled a little on the sides. I'm thinking this is where the hair dryer might have been useful. Definitely going to give that tip a try in the future. I will say though, the bubbles are small, and a lot more visible in the photos than in person. 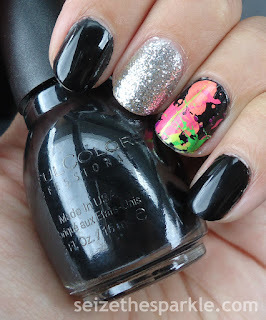 Originally, I had planned to pair Neon Splat with black, neon pink, and a glitter accent nail. That seemed like a little too much, given the glitter and graffiti accents, so the pink was nixed. Honestly, I think it keeps the look on the edgy side, and that's really what I was going for in the first place. 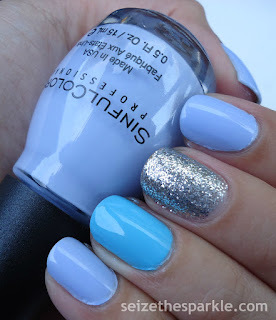 I like the look of this a lot and would definitely wear this exact same mani again! 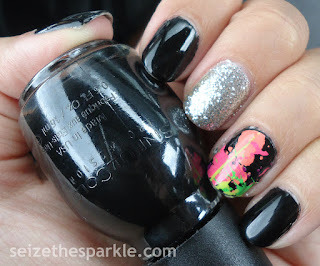 Neon Splat Nail Appliques are part of SinfulColors Street Fusion Collection. You can find them on display at Walgreens and other mass retailers for $1.99 each! Follow SinfulColors on Facebook, Instagram, and Twitter!